Unlike other games in the first Avernum trilogy, Blades of Avernum supports scenarios to be created and added into the game. Scenario list - List of websites that contain Blades of Avernum scenarios and instructions on how to add them. Save games can be created in any location. You can work around many glitches by using game's character editor. When transferring old save games, this can happen because the game acts as a demo and a registration key is required (this does not happen on GOG.com version of the game). 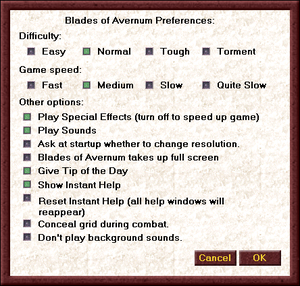 Macintosh: Throw away the "Blades of Avernum Prefs" file in the Preferences folder. Windows: Delete the "BladesOfAvernumData.dat" file in the Avernum Data folder. If you have registered the game, this might unregister it. If your game suddenly becomes unregistered, see Requesting a new key. First solution: Install the demo and request a new key. Open the Install file. A window will open with the game art and an installer with the game icon. It will have a name like "Install Blades of Avernum (Full)". Drag this installer onto your desktop. Hold down the Control key and click on the installer and select "Show Package Contents." Open the Contents folder and then the Resources folder. Open the file "installscript" If it asks you what program to open it with, choose TextEdit. Save and quit. The installer should now work. If you want to play the game with the same key, transfer the Blades of Avernum.dat file (Windows) or "Blades of Avernum Prefs" (OS X) located in the Preferences folder (inside the Systems folder on your hard drive) to a safe place. These are GOG.com system requirements; retail requirements are much lower. ↑ Spiderweb Forums - Avernum 1 - Black screen freeze on main map.